Your little ones are dying to get more of their favorite monster stuff around? Check out this embroidery design which features a blue hurricane monster that might just be the perfect pick! The furious monster has angry purple eyes and its mouth is wide-opened in a roar. 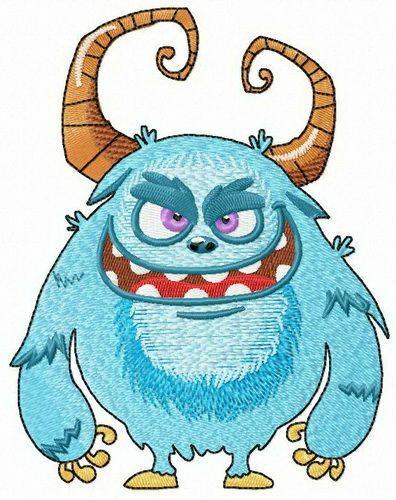 The monster has brown horns and claws and yet he doesn’t appear to be looking that much scary. Your kids will love to have it on their favorite stuff, for example sweaters, T-shirts, backpacks, pajamas, towels, cushions, blankets, quilts, etc. The application stitches out very easily and is compatible with all sorts of fabrics.